Freakonomics of parenting! : 7 precious gifts! FRIENDSHIP - As the saying goes, Friendship can turn into love but love into friendship never. So, thank you for being my best friend in whom I could confide my dreams, inhibitions and fears! LOVE - Thank you for entering my life and filling it up with lots of love. I pray to God that our lamp of love may always be illuminated! TRUST - Thank you, once again, for showing me how to trust our instincts even if others are in disagreement. You remember na my parents were against our marriage! PATIENCE - Again, it was because of you, I learnt the value of patience. Waiting patiently for my parents' nod of approval was one of the toughest times of our life! Also, it was because of your love and care that I could sail through my pregnancy period patiently! COMPASSION - You knew that I was vey much afraid of dogs and didn't take to pets so fondly. When I married you and came to live with you, you showed me how to be compassionate with our pets - Roger and Mithu. RESPECT - After our initial honey-moon period ended and we settled into our marital life, you showed me how to respect each other's opinions and views. HOPE - When there were initial glitches in our pre-pregnancy period, you taught me to not lose hope during that stressful period. 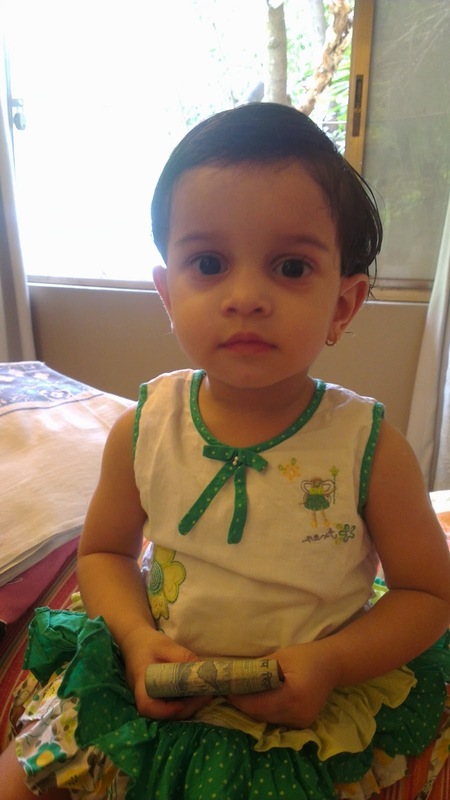 God showered his blessings upon us in form of our beautiful daughter, SWARA. And lastly, you taught me to fight for whatever we believe in! So, here's wishing you a wonderful happy 7th anniversary!